"It is my duty is to help and guide clients to understand the bigger picture by dispensing sound legal advice based on law, extensive years of experience and previous precedents. 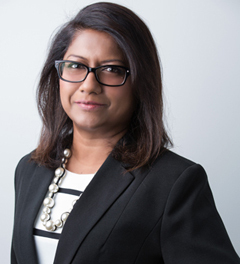 All my clients are presented with efficient legal solutions, in a cost conscious and individualised manner which they deserve"
Gloria James is a Singapore born lawyer of Sri Lankan heritage, bilingual in English and Mandarin with 20 years of legal experience in the field of Family Law. She is an advocate & solicitor, barrister, mediator and collaborative practice lawyer. Gloria has been in practice for 20 years. In the course of her legal career, she has gained considerable experience and knowledge in the area of Family Law, with an approach to handle cases effectively and efficiently in a cost effective manner. She is able to assist her clients to achieve settlement even in the most acrimonious matters. She is a skilled litigator and negotiator who has handled many complex financial and custody cases, successfully representing local & international clients and Singapore`s expatriate community. Her constant training as a Mediator and Collaborative Family Law Practitioner has helped her provide additional services to her clients, enabling them to consider the alternative route to litigation in taking their case forward. Her strong working relationship with other Collaborative practitioners has led successful settlement for cases under the collaborative and mediation route. As a commitment to continuing professional development, Ms James attained certification in Mediating Disputes from the Harvard Mediation Program, under the guidance of Professor Robert H. Mnookin, a leading scholar in the field of conflict resolution. She has also trained with Regent’s University of London under the guidance of Paul Randolph and his team in the area of mediation and management of high conflict personalities in an intensive, emotional and volatile background. Gloria has been appointed as a Child Representative and Parenting Coordinator Lawyer by the Family Justice Courts, representing children in high-conflict, contested family court proceedings. She is also known for her work in other areas of family law, including maintenance disputes, international family law, adoptions, and prenuptial & postnuptial agreements. 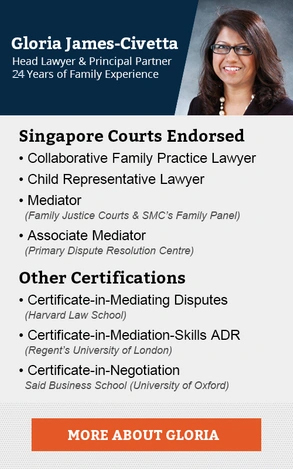 Gloria has devoted a considerable amount of time to writing and developing the www.singaporedivorcelawyer.com.sg blog-site, created to inform people who are considering divorce to learn as much as possible about the process in order to make informed decisions on possible courses of action to take.